ServerLife is the best Tip Tracker app that enables you to clearly see the money you earn. 135,000 people like you have entered over 6 Million tips! Are you tired of never knowing exactly how much money you make because it ends up as cash in your pocket? ServerLife will solve that. ServerLife is perfect for anyone whose income is variable and fluctuates from week to week. Hospitality Industry (Servers, Bartenders, Hosts) Uber & Lyft Drivers Shoppers (Shipt, Instacart) Hair Stylist, Barbers, Makeup Artists Fitness and Yoga Instructors, Personal Trainers Real Estate Agents Sales (Commission based) Freelancers & Entrepreneurs Small Business Owners Self Employed Individuals Postmates Couriers Independent Contractors Enter your earnings at the end of your shift and easily see your totals. You'll be able to clearly see which days pay the best with our powerful filtering and comparison logic. You can easily track the following values for each entry: - Tips - Hours - Notes HISTORY Quickly see how much money you’ve made. The History page will show you the total tips and wages you earned for the any week, 2 weeks, semimonthly, month and year. DAILY AVERAGES Want to see the daily average for any month and year - head over to the Averages page. This page breaks down the daily averages for any month and the entire year. REMINDERS You can configure ServerLife to remind you to enter your tips. We all get busy and forget important things sometimes. Have ServerLife remind you to enter your tips at the same time every day. START OF WEEK Does your pay week start on a Tuesday? No problem you can change the start of the week so that the charts and totals will align with how you get paid. NEXT LEVEL Want even more from the app? Take your tracking to the next level with the in app purchase of the Advanced features. 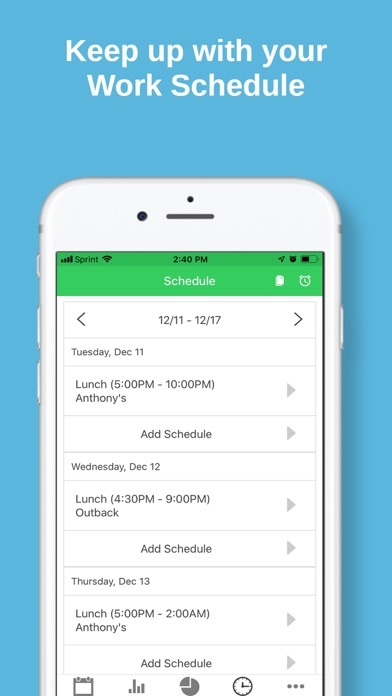 With the in app purchase you'll be able to see: - Work Schedule - Credit/Cash Tips - Expenses - Sales Total/Tip % - Hourly Wage - Covers - Tips/Sales per Cover - Miles/Deliveries - Mile and Delivery Fee - Tip Out WORK SCHEDULE Tired of always referring back to the picture you took of the schedule? 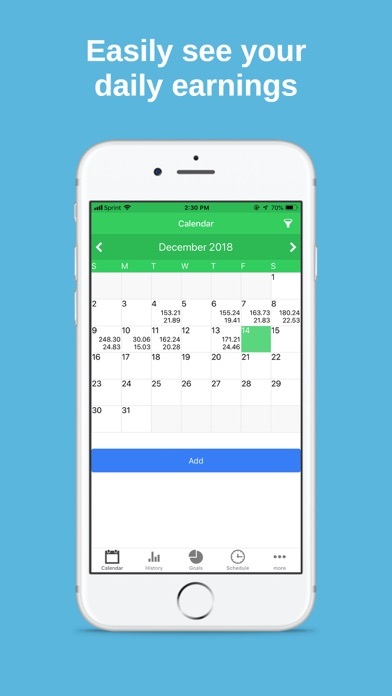 Quickly enter your schedule, sync them to your phone's calendar and add default reminders so you're never late again. EXPENSES Have additional expenses that you payout to work, i.e. childcare, meals at work, transportation, or Tip Out multiple positions? Track them with Expense categories. HOURLY WAGE Want to include your hourly wage with your tips? 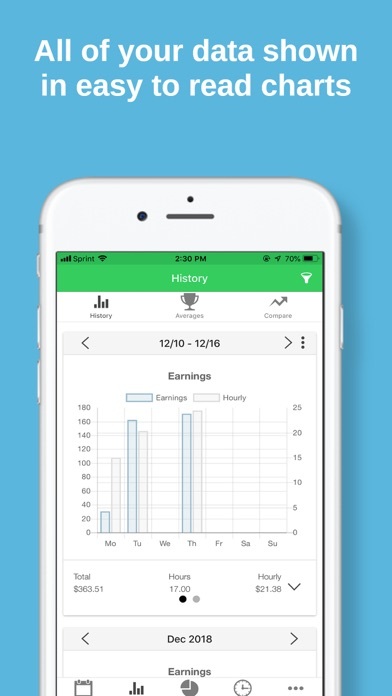 Track your hourly wages so that your earnings are more accurate. GOALS Studies have shown that when you set a goal for yourself you are more likely to progress faster towards that goal. 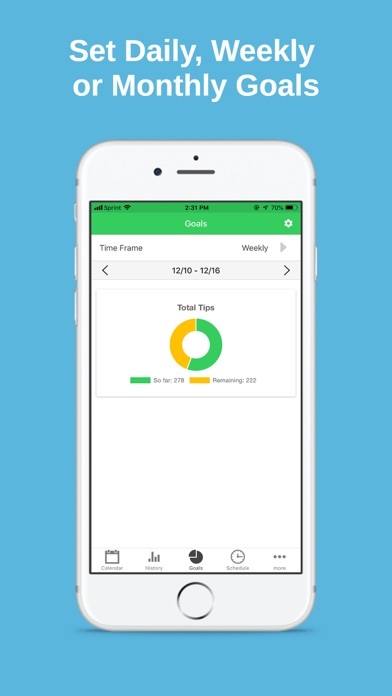 You can set daily, weekly, and monthly goals with any of the 17 fields the app calculates. TRACK MULTIPLE JOBS Work multiple Jobs or different Positions that have a different hourly wage? 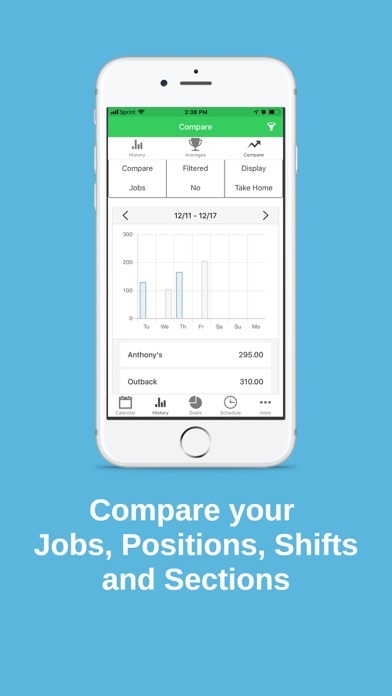 You can track the following with the in app purchase: - Multiple Jobs, Positions (with different hourly wage), Sections, and Shifts (save the typical start and end time and it'll populate when you enter your tip) COMPARE Compare all of these on the Compare page. Here you can compare your Jobs, Positions, Sections, or Shifts to see which one you're making the most money. FILTER Once you start tracking your Jobs, Positions, Sections or Shifts you can filter any of the pages to show any combination of these. You can also filter to show Paychecks or Tips. IMPORT YOUR DATA Upgrading from the Just the Tips or TipSee app? Email us your latest backup file and we'll import it for you. Step by step instructions are located on the Import button on the Settings page. SAFE AND SECURE Your data is always safe and secure. You never have to worry about backup files or when was the last time the data synced with the cloud. All of your data is saved to our private cloud securely every time you make a change. It is available on all of your devices. Even if you lose and get a new phone your data will always be safe. Im a server and I need to track my tips daily. This app displays how much I tip out and gives me an option to show how much gas/toll is paid each day. Great app, iPhone friendly. 100% recommended. Excellent app! Excellent customer service! 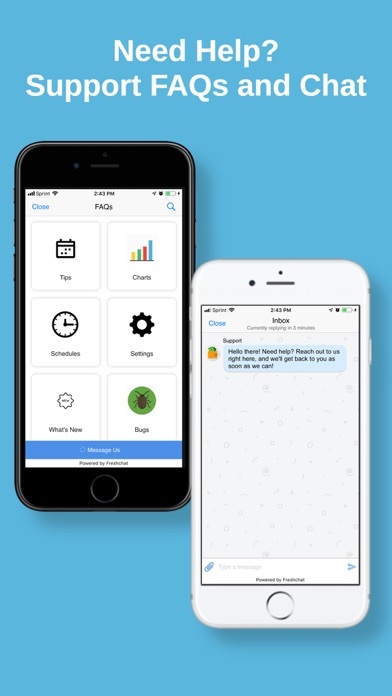 If you need to track just about anything with your tipped job, this app is for you! I LOVE being able to see my stats now that I’ve been using this app since last summer. It’s cool to compare the months and really see just how much (or how little) I earned. I highly recommend it to anyone who receives tips as income. This app is almost perfect, almost. The only complaint I would have is that a lot of times when I try to go on it, I would be logged off... and when I would try to log on it would tell me I can’t log in at the time. Kind of annoying. But like I said, a great app other than that problem! I don’t trust the accountant where I work, one week I’m earning 4.15 an hour, the next 4.50, now it’s 4.30!? 🤨 If the guy can’t keep my hourly rate straight, what’s he doing to my tips, then? So I began keeping all my cash out slips attached to my timesheet- but if I’m being honest about myself, I’m awful at keeping track of all that paper, not with 6 kids to look after, as well. I was going to start keeping a spreadsheet off all my info, but I couldn’t even figure out what all I wanted to keep track of exactly. So I did a bit of Googling, and I found this app, and I’m so glad I did!! 😅 It took me a second to figure out how to enter in my info, but once I read the FAQ, it was a breeze. I haven’t run into too many problems, except I haven’t received any notifications reminding me to enter my tips despite having turned everything on. One feature I would like to see added is the ability to enter in credit card tips, but not cash tips - as it is right now, I *have* to enter *both*, and at my job, cash tips aren’t printed on my server reports, so if I want to go back and enter all my old slips that I’ve saved, I can’t because I can’t remember how much I made in cash those days. Otherwise, this is an amazing app and it’s an invaluable tool for any server, delivery driver, vendor, etc. 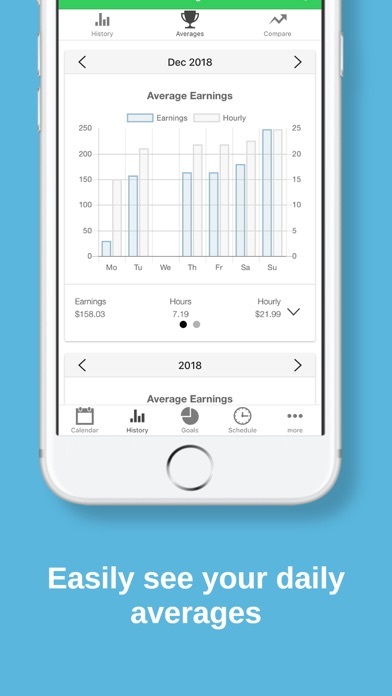 Great easy tool to use to track earnings. This app is so easy to use and keeps all of my income organized. I highly recommend it.